Last night, Blindspot really got it right. It’s become the norm now to have an episode after every other two or three mediocre installments that manages to stand out and be what the show should be every week. “Erase Weary Youth” addressed the main concerns I had last week head-on, by featuring an exceptionally well-written antagonist for the episode’s story arc and not focusing on a procedural tattoo mystery. “Erase Weary Youth” starts off with Olivia, the woman who murdered Patterson’s boyfriend, David, a few episodes ago, getting ready for her arraignment for David’s murder and her activities as a spy. She reveals to her lawyer in the women’s restroom that she can give the name of a mole in the FBI whom the Russians are using. The lawyer reveals herself to be a Russian operative and, out of nowhere, goes all Hitman on Olivia by smashing her head against the sink counter. She then drowns her in a toilet. A security guard arrives on the scene and kills Olivia’s lawyer right afterwards. Not bad for an opening sequence! Fischer is back in the office once again, to snoop around and try to get the team in trouble, claiming that one of them is the mole. At first, being that this was his second appearance in the second half of this season, I thought he’d be the new Tom Carter—the guy who’s officially on the good guy side but has it out for Jane. And it turns out I was right, but also wrong. Fischer was out to get Jane, and almost managed to, but not before Jane was able to kill him. So we won’t be seeing him anymore. It was a great plot twist having Fischer as the mole, with Kurt figuring it out by piecing together little clues from the beginning of the episode. By the time it was revealed, it wasn’t quite that shocking, but it was still enjoyable and exciting to see Kurt work at it, and chase Fischer after he’d taken Jane into custody, accusing her of being the mole. The subplot of Edgar dating Kurt’s sister, Kate was addressed, but it doesn’t seem to be going anywhere substantial. Edgar confesses to the relationship to Kurt and of course, Kurt is not cool with it and tells Edgar to end it. Kurt mentions his displeasure to Kate. Perhaps she’ll listen to Kurt and stop seeing Edgar, or perhaps she’ll continue to date him in secret. As unimportant as this subplot may seem now, it’ll surely (hopefully) lead somewhere compelling in a future episode. Jane shooting Fischer is a big moment from this installment that will hopefully be addressed in the next week or two. Fischer was reaching for his gun when she shot him, so it was self-defense. There’s something in the timing of it all that makes one wonder if Jane could have stopped him by wounding him. She’s not a murderer and she’s not harboring any secrets that we as an audience don’t know of, but one wonders if there was something instinctual from her mysterious former life that resulted in her not hesitating to kill him. We’ve seen her get aggressive and she’s not afraid of a little blood, but there’s still so much we don’t know about her. According to Oscar, she’s not with the FBI to help them; they’re the enemy. In the last couple of minutes, Jane meets up with Oscar and tells him she wants answers now (echoing the audience’s frustration as well). Of course, Oscar doesn’t spill the beans. He tells her he has a pressing tattoo case to bring to her attention, but she doesn’t want to hear it and leaves. Oscar has become nothing but a cryptic character at the this point. All he does is tell Jane that she orchestrated this, she’s part of Orion and the FBI is not to be trusted. He never bothers to answer why, and it seems really strange that he wouldn’t tell Jane anything about what she apparently planned herself. Of course, Blindspots’s writers may want to hold out on important reveals and save them for future episodes (which we’re well acquainted with them doing by now). How long is it going to be though, until the audience takes Jane’s route and decides to walk away? 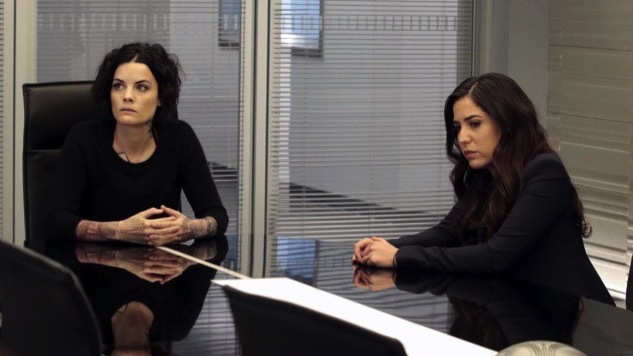 This was one of Blindspot’s best episodes, but the series needs to carefully avoid going back into the same pitfalls.